Historical film Rudhrama Devi’s shooting is currently going in the Vikarabad region. Some important scenes involving Rana Daggubati and other actors are being shot today and the film is in the final stages of completion. VFX rendering and other such activities are already underway. The movie is being directed by Gunasekhar and he is hoping to score a massive hit with this movie. A lot of money has been spent on lavish sets and realistic art work, supervised by Thota Tharani. Ilayaraja has composed the music for this movie. 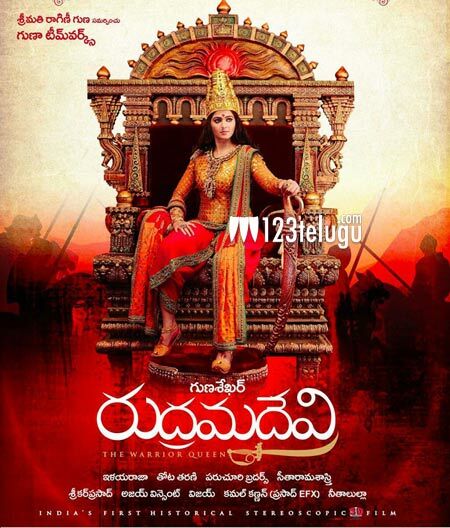 Anushka will be seen as Queen Rudhrama Devi in this 3D film and Ally Arjun is going to be seen in a guest role as Gona Ganna Reddy.